Here you can discover a fascinating corner of hidden Britain and experience the mysterious ‘remoteness’ of one of the significant cradles of Celtic Christianity. The Low Furness Peninsula, a recognised Hidden Britain Centre, has shaped and been shaped by humankind for at least 3,000 years and the emerging history and archaeology add further mystery to the particular influences left by Druidic, Roman, Celtic, Viking, Puritan and Victorian faith builders and settlers in their time in this place. Few places in Britain can boast as much rural variety as this; miles of wild and diverse coastline to explore from the endless sands of Bardsea beach to the raw and atmospheric reaches of Roe Island and Piel Island. Inland, rich farmland, small hamlets and woods rise to reach the limestone pavements and heights of Birkrigg Common with its panoramic views of Morecambe Bay and of the nearby Lakeland fells. Within touching distance of Low Furness’s deeply rural communities are bustling Ulverston, South Lakeland’s Festival town with its famous markets and Laurel and Hardy Museum, and Barrow-in-Furness, ‘where the Lakes meet the Sea’, home of ship-building, with its Festival of the Sea and its renowned Dock Museum. As well as providing much of interest in its own right, Low Furness also provides an ideal base for visits to a wide area of South Lakeland and its fringes by foot, bike, bus, car, boat and even by steam! Well, here’s a five-course meal: the area played a hugely important role in ancient transportation and trading routes and in their turn ancient Britons, Romans, Celtic travellers, monks and ‘saints’, and Vikings have all left their early marks on Low Furness. The area includes a recently rediscovered ‘colony of light’ with unique spiritual and historical links to Iona and to the Northumbria Community of Aidan, Hilda, Cuthbert and others. The website is designed to help you to find resources, plan your stay, or to extend your itinerary having explored other parts of Cumbria. 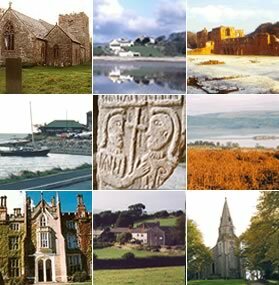 Here on-line you can get the ‘feel’ of the area via a guided journey around the churches and other spiritual sites, download walks which specifically explore the local heritage, read about our history and exciting archaeology, and contribute to the living history of Low Furness.